Cerberus Rex is an hour-and-a-half long science fiction podcast directed, produced and edited by Jason Hardcastle. I’m hesitant to refer to it as a podcast, for fear of giving the wrong impression. While podcasts tend to take on a lightly informative talk-back radio style, this is in fact a tightly woven fictional program. The story centres on Dr Anabela Correia, a professor of astrophysics at Hawksmoor University. When a former colleague requests her help in solving a mystery of physics, she travels to a remote research facility called Well Station. It is a puzzling situation, but like all good protagonists, Correia accepts the invitation. At Well Station, she meets Security and Containment Officer, Benjamin Wyngarde. They travel together to a bizarre underground cave with inexplicable physical properties. These two characters are immediately different, in style, behaviour and approach to the mysterious cave, but it’s Anabela Correia who drives the story forward. It is action driven; not packed full of monologues and exposition. A dialogue driven audio adventure could have been difficult, without the physicality of actors and blocking, but Cerberus Rex works well. The show is told entirely through dialogue, sound effects and music. This means the quality of the audience’s experience depends equally on story, writing, the strength of the voice actors and the quality of the production. The music, score, foley and production come together to create an immersive and engaging audio experience. The first half of Cerberus Rex focuses on the physics at play within Well Station; there is a touch of time travel, displacement, and the general unknown. Then, suddenly, the story takes a more action-based shift as the lives of Correia and those around her are threatened by an unknown entity (I won’t spoil it here). From then on, we get more of a ‘close encounters’ vibe. The action eventually comes down to how she confronts the unknown, despite the “best” advice given to her by John Brant, the security control officer. Correia is such a well-written character, that I probably could’ve listened to her deliver an astrophysics lecture for the whole hour and a half. She is immediately engaging in both character and performance. Natali de Assis does a wonderful job as the lead voice actor of Cerberus Rex’s inquisitive protagonist. At times, her voice took me back to 2014 when I was listening to Sarah Koenig’s Serial; the investigative journalism podcast that put podcasting on the map. The show is titled Cerberus Rex, after the dog who guards the gates of the Underworld and a tyrannosaurus rex. But perhaps it should’ve been titled Cerebral Rex, as it’s the intelligence of its lead character that guides the action. Hardcastle does well to immediately appeal to his audience as the story opens with an engaging puzzle. I must confess: I thought I would casually listen to this podcast while I painted my son’s bedroom. Instead, I sat down on the floorboards and listened intently. 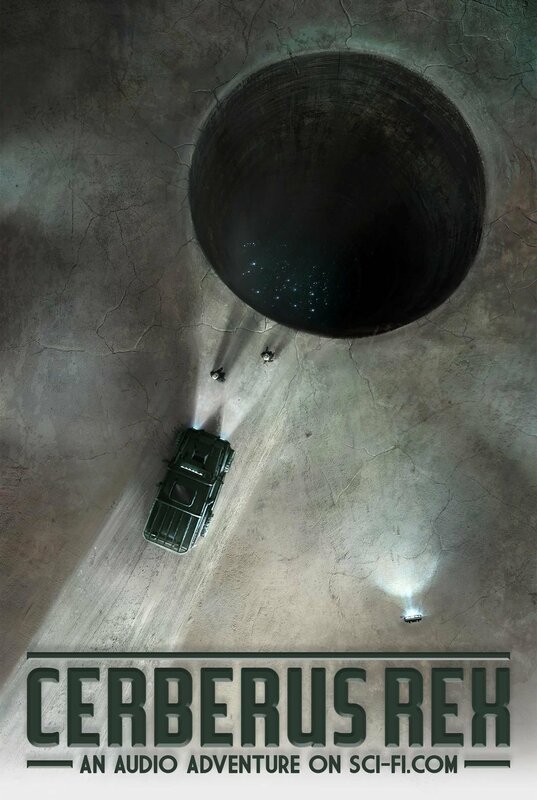 Cerberus Rex will appeal to audiences who enjoyed the movies Arrival (2016) and Contact (1997), and James Bradley’s novel, Clade (2015), where the character who’s the most open-minded and scientifically curious ultimately survives over those who turn to guns, weapons and a “shoot first, ask questions later” mentality. The show doesn’t break any new ground in terms of sci-fi themes and plotting, but at the centre of the tale is a lesson in communication, language and how best we can approach the unknown. I’m assured there’ll be more Cerberus Rex in the near future, but in what form, it’s yet to be determined. The ending is open enough that it could be the start of a much more complicated mystery between Dr Correia and the unknown. But, at the same time, it’s also a well-made, standalone production that’s worth checking out.